, NHL scores in search results and our content partnership with the NHL on YouTube. And this year a few Googlers in Chicago tried to grow their own playoff beards to get in the spirit of the games. 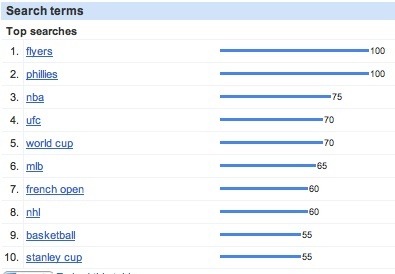 We see a surge of search queries related to the Stanley Cup every May, and this year is no exception. As each of the two teams get closer to hoisting Lord Stanley’s cup, we’re taking a look at what people from Chicago and Philadelphia as well as around the world are searching for related to the Cup. 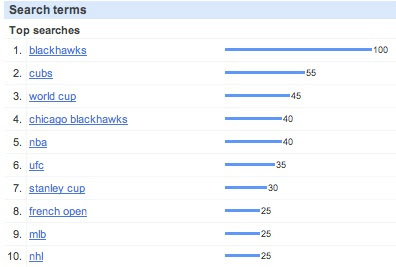 Globally, searches for [blackhawks] trump searches for [flyers] in the sports category although both are experiencing an unprecedented spike compared to past years. 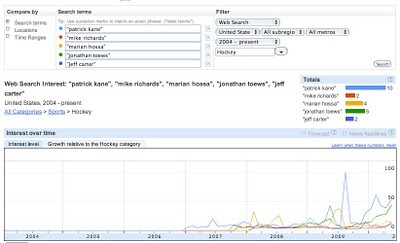 Searches for [patrick kane] of the Chicago Blackhawks lead the way among searches for players involved in the Stanley Cup Finals. 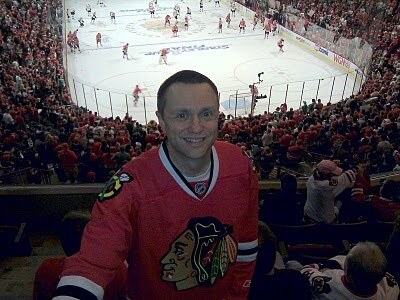 After each goal scored in Chicago, the Blackhawks play the song “Chelsea Dagger” by the Fratellis. Accordingly, searches for [chelsea dagger] are surging, with Google users in Illinois topping the list and sparking a resurgence of the song across America. With Googlers in our offices in both Illinois and Pennsylvania, we’ll be watching like the rest of the world to see who wins the greatest trophy in sports. Just make sure you don’t touch the Cup until you actually win it! Although it feels like summer in many parts of the world, this week much of the North American sports community is focused squarely on ice hockey. That’s because the Stanley Cup Finals between the Chicago Blackhawks and Philadelphia Flyers kicked off over the weekend. Today, the series shifts to Philadelphia, and the Flyers look to even the series. We’ve always shared the world’s interest in ice hockey, and have expressed that through our 2010 Olympic Ice Hockey doodle, NHL scores in search results and our content partnership with the NHL on YouTube. And this year a few Googlers in Chicago tried to grow their own playoff beards to get in the spirit of the games.